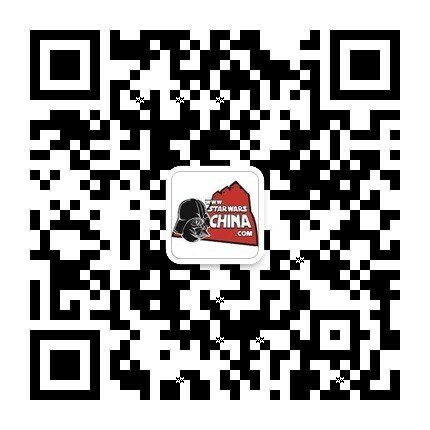 ﻿﻿ 科雷利亚（Corellia） - Databank - 星球大战中文网 Star Wars China - Powered by Discuz! Home planet of the gregarious Corellians, Corellia is a world renowned for its impressive shipwrights who build large, speedy and powerful vessels. Corellia has also earned an infamous reputation for the many pirate raids carried out in nearby trade routes. A temperate world covered by rolling hills, thick forests, lush fields, and large seas. Since the inception of the Republic, Corellia has always proudly followed its own path, occasionally at the expense of the larger galactic community. It is a fiercely independent world governing a fiercely independent sector that has traditionally been inward-looking, detached from seismic political events that have reshaped the galaxy time and again. Corellia and four other planets orbit the star of Corell in the Corellian sector. The entire system is an astrophysical curiosity, an enigmatic relic possibly left behind by an incredibly advanced ancient culture. As unlikely as it seems, all five planets are habitable, and floating between Tralus and Talus, the Double Worlds, is an immense artifact known as Centerpoint Station. It is an unimaginably ancient device floating at the gravitic balance point between both worlds. Some xenoarchaeologists posit that Centerpoint was employed by an ancient, incredibly powerful culture to move the planets of the Corellian system into place. Corellia is known as the "Elder Brother" of the system, serving as the administrative center not only for its "Brother planets" Drall, Selonia, Talus and Tralus, but also the entire sector. The planet is governed by a Diktat, while the sector itself was represented in the Galactic Senate by a Senator. Corellia is a beautiful world of fields, forests and seas. 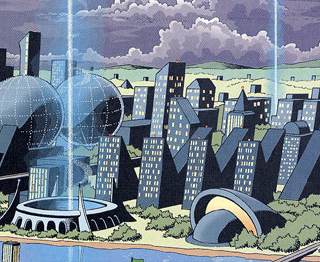 Despite its age and influence in Galactic affairs, it has not become a completely urbanized city planet like Coruscant. Corellians take pride in the open expanses of razor grass fields and unpolluted sandy beaches. Their solution to urban overgrowth was in moving shipbuilding facilities off-planet. The shipyards of such monolithic companies as the Corellian Engineering Corporation are immense, producing such famous vessels as Corellian CR90 corvettes, Republic cruisers and the ubiquitous YT-series freighters. Corellia's cluster of continents are bracketed by two huge oceans, an eastern and western one. The capital city of Coronet lies on a coastal front along the Golden Beaches, with other cities such as Bela Vistal and Tyrena. Though the planetary population has fluctuated during the decades of the Galactic Civil War, it numbered over 15 billion, with Coronet being the largest single concentration of citizenry. Scattered inland are a number of small towns and farming hamlets. Though Coronet was a bustling city, it was filled with parks, plazas and open-air trading stalls, indicative of the Corellian love of wide open spaces. One of the most popular locales was Treasure Ship Row, an garishly eclectic bazaar filled with a complex tapestry of alien cultures. The native species of the Corellian system -- humans, Selonians and Drall -- could be found throughout Coronet. Selonians preferred to live beneath the surface of the planet, in complex warrens and tunnels that date back to pre-Republic times. Also located beneath Corellia's soil is an ancient planetary repulsor, further evidence of the planet having been relocated by an unknown alien force in the far distant past. The Corellian system was wealthy enough to afford its own fleet and security forces. During the time of the Republic, it handled its own law enforcement free from the involvement of the galactic government. The Corellian Security Force, or CorSec, remained largely intact even after the rise of the Empire. Even Corellian Jedi were reputed to be non-traditionalists in that most ascetic of orders. Corellians have a cultural wariness towards big galactic government. Though one of the founding worlds of the Republic, Corellia has fostered a tradition of independence, and has, during its long history, attempted to vie for separation from the union more than once. When Count Dooku's Separatist movement arose during the waning days of the Republic, Corellia tried to remain neutral in the conflict. Not wanting to be involved in a decisive Military Creation Act vote that would determine the future of armed conflict in the galaxy, Senator Garm Bel Iblis withdrew Corellia from the vote, and sealed up its borders, hoping to wait out the coming conflagration. His attempt at isolation failed, and before long, Corellia too was dragged into the Clone Wars that followed. With the rise of the Empire, Corellia once again bristled under the authority of Coruscant, but did not actively join the Rebellion. The shipyards of Corellia were controlled by the Imperial starfleet, and many Corellians were drafted into Imperial service. As the sector's native military forces were dispatched throughout the galaxy to deal with the growing Rebellion, piracy bled into Corellia's borders, disrupting the valuable trade that had kept Corellia independent for so long. Senator Garm Bel Iblis disappeared from galactic politics, waging his own private war against the Empire, while many Corellians joined the nascent Alliance. As the Rebellion began scoring increasingly larger victories against the Empire, the Corellians enacted strict isolationist measures, restricting trade and ship traffic through the region. Under such hermetic conditions, the population of the sector fomented an almost xenophobic character, encouraging a paranoid resentment towards outsiders. With the collapse of the Empire started at the Battle of Endor, Corellia suffered as Imperial forces withdrew to shore up defenses at Coruscant and elsewhere. The Corellian Diktat, who was little more than an Imperial puppet, lost his power base and became a target of resentful Corellians. He fled to the Outlier section of Corellian sector, prompting the collapse of the Corellian government. Into this mess stepped the New Republic, who appointed a new leader to help clean up the disarray. Governor-General Micamberlecto attempted to infuse order into a bewildering tangle of conflicting agendas. Many of the humans who prospered under Imperial rule held great disdain over the new government and the cultural aversion to outsiders created a great challenge to the New Republic's efforts. Fourteen years after Endor, Chief of State Leia Organa Solo voyaged to Corellia for an historic trade summit, eager to work out some of sector's problems. Instead, she was drawn into a sudden flash-fire of insurrection that history would later recall as the Corellian Incident. The Sacorran Triad, a secretive council of human, Drall and Selonian dictators based in the Corellian sector, had grown in power since the collapse of the Empire, and attempted a coup of the sector that would ensure Corellian independence. The Triad took control of Centerpoint station's immense repulsorlift technology to target distant stars for destruction, and essentially hold any system hostage lest its demands be met. This bid for independence was thwarted by the efforts of a joint New Republic and Bakuran task force, and the actions of the young Jedi siblings, Jacen, Jaina and Anakin Solo. Corellia continued its bid for independence in the aftermath of the war against the Yuuzhan Vong and the Swarm War, conflicts that resulted in the disintegration of the New Republic and rise of the Galactic Alliance. The GA sought to exert increased authority over the worlds that belong to it by attempting to centralize the military --- to bring any planetary military forces under the command and aegis of the GA armed forces. Corellia refused to comply. Corellian leader Thrackan Sal-Solo believed that the Galactic Alliance had done little to improve the standing of the Corellian system, and demanded that Corellia be given its freedom to pursue its own goals. The Galactic Alliance refused, stating that Corellia wanted all the benefits of membership in the GA without having to shoulder the responsibilities. Tensions on both sides of the conflict escalated, particularly once Jacen Solo was placed in command of the Galactic Alliance Guard, and Corellians who were living on Coruscant were either forced to leave the planet or arrested as terrorists. Years before the actual start of any fighting, Sal-Solo secretly began creating two fleets of military warships, at separate shipyards located in the Kiris Asteroid Cluster. He hoped to bring the new warships to bear against the Galactic Alliance, but their existence only served to draw the GA's attention to Corellia. Galactic Alliance forces blockaded the Corellian System, hoping to forestall any fighting, but were forced to withdraw to Tralus. There, a small battle was fought, in which the forces of the Galactic Alliance were driven off, but the end result only served to reinforce the Galactic Alliance's blockading fleet. Many Corellian believed that Sal-Solo's assassination by Boba Fett and several unidentified agents would put an end to the conflict, but Dur Gejjen chose to prolong the hostilities, and even brought Sal-Solo's hidden fleets into the war, using them to bolster Corellia's defenses and sending a portion of the fleet to Hapes on a mission to assassinate the Queen Mother, Tenel Ka. This mission, which Gejjen hoped would draw the Hapes Consortium's potent naval forces over to the side of the Corellians, ultimately failed. In the relative calm that followed the Hapes debacle, a strained stalemate ensued, with Galactic Alliance forces maintaining a far-reaching blockade, and Corellian forces patrolling the system within the blockade's boundaries. The conflict caused many species, including the Bothans, to demand Corellian independence, in the hopes that they might also gain their independence from the Galactic Alliance. These disgruntled systems joined Corellia in forming the Confederation, and allied themselves against the Galactic Alliance. 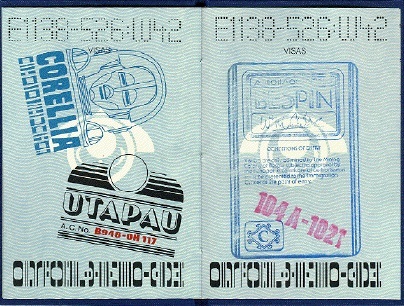 In early Expanded Universe sources, the name of the Corellian homeworld was also noted as Corell and Corelli, though the name Corellia can be traced back to a set of InterGalactic Passport souvenirs printed around the time of The Empire Strikes Back. Corellia would remain largely unexplored as a setting until a trilogy of novels published in 1995 took the heroes of the Rebellion to the system to deal with the Sacorran Triad insurrection. That series, written by Roger MacBride Allen, consisted of Ambush at Corellia, Assault at Selonia and Showdown at Centerpoint.